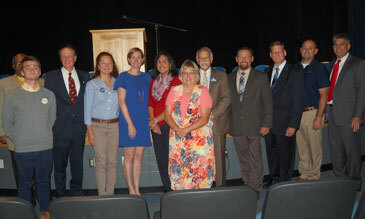 Many of the candidates whose names appear on the ballot in the November election in Barbour County were on hand to meet with the public during the recent Candidates Night at Philip Barbour High School. The event was sponsored by the Barbour County Chamber of Commerce. Chamber President Reg Trefethen welcomed the audience and served as the official “timer” for the evening. Mike Cvechko of Cvechko Insurance did an outstanding job as the Moderator. The Chamber is grateful to Ron Phillips from Builders Center and Dion Wagoner from the Good Samaritan Society who volunteered to serve as ushers. The meeting space was graciously provided by the Barbour County Board of Education and the high school. Candidates took several minutes to introduce themselves and then replied to questions from the floor. Statements were read from Cong. McKinley represented by Chris Phillips, West Virginia Attorney General Patrick Morrisey represented by Dave Sypolt, and U. S. Sen. Joe Manchin represented by Ben Vester. Candidates responded to questions concerning their stance on West Virginia Amendment 1 on the subject of abortion, and Constitutional Amendment 2 concerning the budget of the West Virginia Supreme Court. Candidates also debated the use of the state budget surplus, the funding of teacher retirement, the future of Social Security, immigration, economic and social problems at the local and state level, and the role of government in solving social problems. Candidates, or their representatives, who participated included from left above: Jeff Woods for the West Virginia Supreme Court, Ben Vester, Supreme Court candidate Harry Bruner, Stephanie Zucker for the West Virginia Senate, Kendra Fershee a candidate for the U. S. Congress, Supreme Court candidate Joanna Tabit, County Commission candidate Cindy Hart, House of delegates candidates Ed Larry and Chris Phillips, West Virginia Senator Dave Sypolt, County Commission candidate Jamie Carpenter, and Moderator Mike Cvechko. Attending but not pictured was state Supreme Court candidate Brenden Long. The next meeting of the Chamber will be held at the Medallion Restaurant on October 4th to hear Antero Resources Vice President Al Schopp discuss the oil and gas industry in Barbour County.